ClipConverter is a marvelous online media conversion software developed by TopByteLabs, which helps to record, download and convert streaming web videos to MP4, MP3, AVI, AAC, WMV, etc. While this free online tool has been established a large user base, there are still a great number of people complaining about it and wanting a ClipConverter alternative thereby. Below are some typical cases about this converter from some forums. Despite ClipConverter incorporates many distinctive features, you will still want some similar sites like ClipConverter replacement due to some drawbacks listed below. 1. ClipConverter not working for YouTube: YouTube changes constantly, which is the main fact that causes video downloading issues in many YouTube download tools, and it is of no exception. So people demanding to save YouTube videos will need to find an alternative to clipconverter. 2. Mac incompatibility: it is able to download and convert online videos to various formats but unfortunately, MOV is out of the format supported list, making it not working on Mac well. For people who are wishing to download YouTube video on Mac, turning to a ClipConverter Mac alternative is must-have. 3. Limited output formats/devices supported: As is known to all, this online media converter supports downloading internet videos audio to many formats like mp3, mp4, 3gp, wmv, flv, avi, mpg and aac. But in case you want to download YouTube video to MOV, MKV, etc or directly convert YouTube video to iPhone, iPad, Android, etc, ClipConverter will function unwell. This is also a big argument against using it. The three drawbacks listed above will drive you to find an equivalent to Clip Converter. But what is the best ClipConverter alternative? 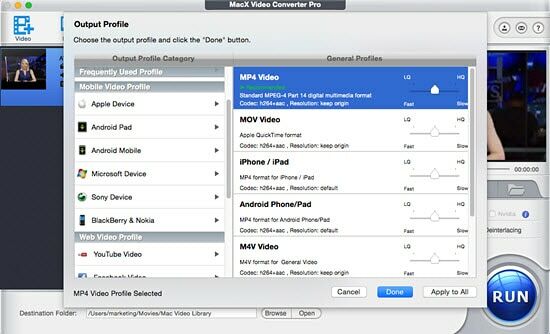 Well, you'll be no longer bothered by this issue because MacX Video Converter Pro will be your solid choice. It enables you to download videos (4K/8K UHD) from YouTube to Mac, MOV, MP4, AVI, WMV, MKV, MP3, M4V, AAC, AC3, etc with high quality reserved that ClipConverter doesn't manage to do, and convert YouTube video to iPhone X/8/7/Plus, iPad Pro and more with 410+ preset profiles. Its support of Intel QSV/Nvidia/AMD hardware acceleration tech guarantee the world's fastest conversion speed, up to 5X faster than any other converters. Warm tips: Make sure that you've get the alternative to ClipConverter downloaded on Mac OS and fire it up before you download YouTube videos. For PC users, you can still go to its windows version for downloading. Launch this Clipconverter Mac alternative and hit "YouTube" button. You don't even need to download the YouTube video file to Mac computer. Click "YouTube" button, copy and paste the YouTube FLV video URL to the type box. After you click "Auto add to convert list" and "Download Now", the rest video downloading job will be automatically done by this app. Choose the output format you want from the pop-up window. For instance, if you want to simply convert YouTube video on Mac OS, just choose the QuickTime supported format MOV from the drop-down list. For a directly YouTube conversion on your device, just choose the device you like. Hit the "RUN" button and start YouTube downloading and conversion on Mac OS X with this best Mac ClipConverter alternative. All the tasks can be finished at fast speed and high output quality. 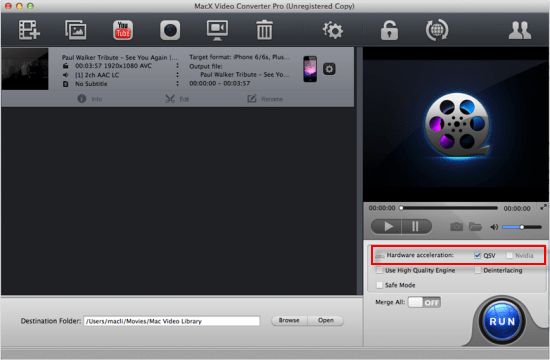 Besides the excellent YouTube downloading and converting ability, MacX Video Converter Pro has many other amazing features that Clip Converter doesn't have. For instance, it is equipped with the wondering editing function that lets you touch up your video at your disposal, the funny slideshow making feature that endows you to create slideshow with photos and music, and the great screen recorder which not only helps you record game walkthrough but also iTunes movies without worrying about the protection.